Lansky Crock Stick, Deluxe Turn-Box Knife Sharpeners feature alumina ceramic knife sharpening rods. Simply insert the rods into the base, and sharpen your knives with an easy slicing motion. The Crock Stick Deluxe Turn-Box Knife Sharpener is compact and portable-just right for the great outdoors. This 2 stage sharpening system has a hardwood turn-box that is pre-drilled on the top with rod angle holes for 20 degrees and 25 degrees. Use the 20 degree angle to thin and tune the bevel of the blade; then move to the 25 degree angle for final sharpening and polishing. 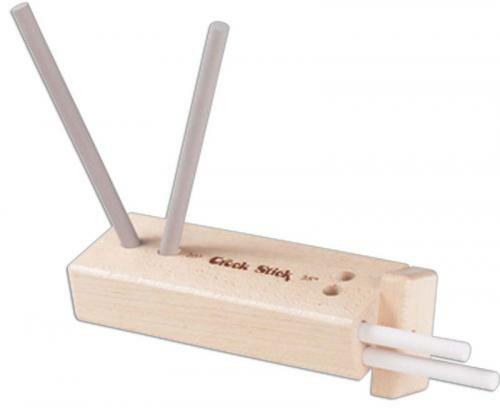 This knife sharpener comes with 4 alumina ceramic rods-2 medium and 2 fine, with an overall length of 5", and a wood turn-box with internal rod storage. my favorite knife sharpener. its compact for packing in your gear. it puts on a razor edge for dressing deer or filleting fish.